Coloring Books > About Us | Really Big Coloring Books, Inc.
Company Overview - Really Big Coloring Books®, Inc. In 2004, Kenneth N. Rich joined the company as the COO and RBCB business partner. Mr. Rich has a strong background in the financial industry, having worked with the modern integration of multinational financial banking systems. With degrees in marketing and business, he has helped to bring RBCB to its current global structure. Ken is also involved with company strategic development with particular attention to details, new company relationships and pertinent government-business industry regulations and changes. RBCB owns approximately 800 registered working Internet domain names in several countries relating to the words, coloring (colouring) and books—while successfully beginning to vertically integrate this sector of the children’s publishing industry and dominating the Internet side of the coloring book business. The company has a dynamic web presence from Amazon.com to mass retail, independent grocers to local bookstores, retailers and is enjoyed by those that enjoy coloring. RBCB has a recognizable brand that is permeating the globe. In 2009, RBCB helped launch the nation’s first electronic and digital format coloring book for in-home and professional use on a mass retail scale. In 2013, the company launched digital coloring books globally in 29 select countries in partnership with Samsung’s Learning Hub application. RBCB serves clients from the educational sector to government, the movie industry, and many groups of business, local authors and publishers, to a mom with a child’s birthday party. The company’s mission is to provide classic, colorful and unique coloring and activity book products to all clients. With attention to the brick and mortars, RBCB has made entrance into more than 15,000 retail outlets with major distributors in several countries. When you think kids coloring books, think ColoringBook.com. Known for their market leading positions, the Really Big Coloring Books ® Inc. family of products is classic, colorful, unique and on occasion controversial. Their products are a true factual representation of the landscape through the medium of kids coloring and activity books. Covering numerous topics and subjects, the company’s products not only reflect America but are multicultural, multinational, many are bilingual used by educators, parents and children between the ages of 2-13 years. With full service operational graphics, design, print and marketing capabilities, the company acquires and looks for art talent throughout and beyond North America. RBCB provides an outlet to established nationally known brands and names as well as the up and coming writers, authors, publishers and individuals who may dream of or want to be a participant in the children’s coloring and activity book business. 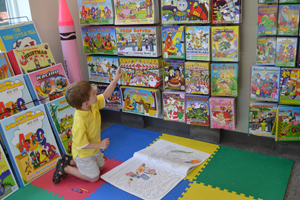 RBCB listens to and appreciates their customers, patrons, employees, critics, competitors and business relationships while striving to achieve the very best in children’s coloring book products. 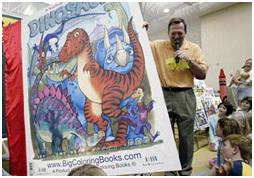 Really Big Coloring Books ®, Inc. has received acclaim and criticism from national, television, cable and international print news on some of their products. Recently, the original President Barack H. Obama Coloring & Activity Book and the wildly popular “Tea Party Coloring Book for Kids” received global attention, appearing in more than 3,000 media outlets in eight countries, both books sky rocketed to the No. 1 best seller list in many divisions, markets and locations including Amazon.com. From the markings on cave walls in Europe thousands of years ago to the high tech masterful digital imagery of today, RBCB believes children will always continue to color. With total commitment to the American work force, using sustainable and ecological green technology, our passion is to provide children and their parents with some of greatest coloring books to ever be made. From past endeavors to the future, our commitment is to America-made products and the consumer. Many of the company products are union-made. Comments, criticism or praise is always welcome and received as we continuously strive to become the very best, second to none, at what we do, for you. 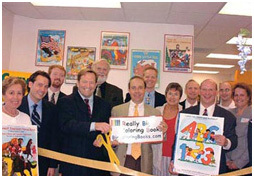 Really Big Coloring Books, Inc. ® headquartered in St. Louis, MO, operates four divisions; Retail, Fundraising, Internet and Creative Development. Call us anytime at 314-725-1452 (or 1-800-244-2665) or email us at info@coloringbook.com. 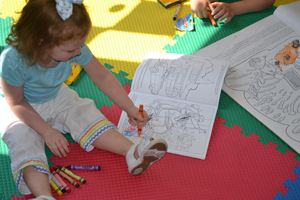 Really Big Coloring Books,® Inc. uses green technology that is friendly to the environment.